This positive, straightforward book offers kids with autism spectrum disorders (ASD) their own comprehensive resource for both understanding their condition and finding tools to cope with the challenges they face every day. 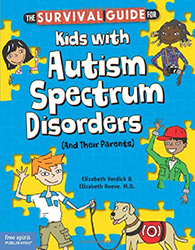 Meant to be read with a parent, the book addresses questions (“What is ASD?” “Why me?”) and provides strategies for communicating, making and keeping friends, and succeeding in school. Body and brain basics highlight symptom management, exercise, diet, hygiene, relaxation, sleep, and toileting. Emphasis is placed on helping kids handle intense emotions and behaviors and get support from family and their team of helpers when needed. The book includes stories from real kids, fact boxes, helpful checklists, and resources. Sections for parents offer additional information.